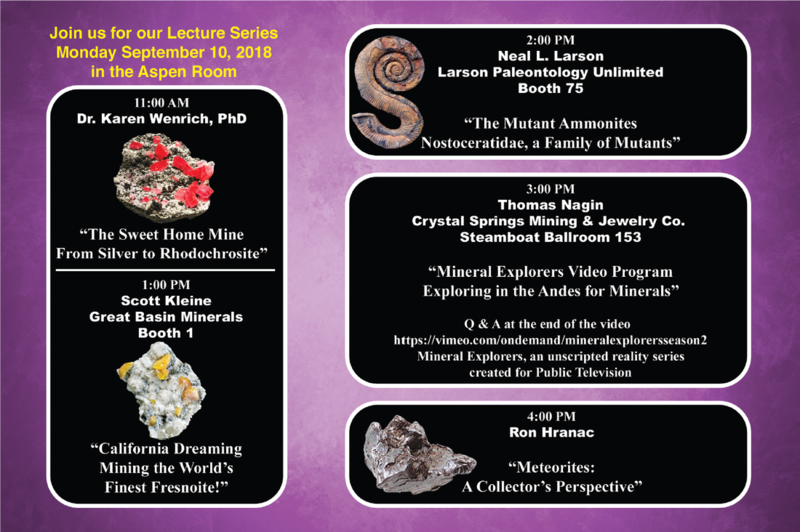 by Dr. Karen Wenrich, Ph.D.
We are pleased to announce that Dr. Karen Wenrich will be speaking about the geology, geochemistry, and historic and recent mining history of the famous Sweet Home Mine, near Alma, Colorado. The Sweet Home Mine Pb-Ag mining began in 1872--the mine holds U.S. Patent #106--one of the 1872 Mining Law's oldest. Based solely on its unimpressive silver output, the Sweet Home should have faded into obscurity and abandonment a century ago. 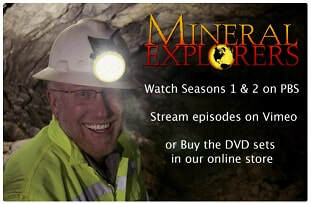 However, the tenacity of miners allowed it to operate intermittently for over 120 years. The last silver mining occurred in 1966. During the 120 years many museum quality cherry-red rhodochrosite rhombs in association with quartz, fluorite, and multiple sulfides were removed, and some sold as far away as to the Harvard Museum around 1900. Far more money has been made from Sweet Home rhodochrosite than was ever made from silver ore. In 1991, Sweet Home Rhodo, Inc (Bryan Lees and others) reopened the mine and operated it as a specimen mine until 2004 when it was cemented closed. During that time what are widely acknowledged at the world’s finest rhodochrosite specimens were collected; including the Alma King and the “Denver Wall of Rhodochrosite” a reconstructed plate of 1-2 inch rhodochrosite rhombs on quartz that is on exhibit at the Denver Museum of Nature and Science. Although a number of researchers had studied the chemistry of the hydrothermal fluids responsible for formation of the vein orebody and associated gangue minerals, Bryan Lees reached out to Dr. Karen Wenrich in 1994, and asked her to conduct a geochemical investigation to determine the conditions associated with the rhodochrosite mineralization. Dr. Wenrich’s talk will review what was learned at the Sweet Home Mine, findings that along with detailed new geologic mapping at themine led Bryan Lees to reopen the mine in 1991 in the hopes of finding additional pockets of world class rhodochrosite specimens,and what might be the inspiration for opening the new mine, the Detroit City Mine, in 2017. Dr. Karen Wenrich graduated from 3 years of high school in Wiesbaden, Germany, after spending her childhood being dragged around the U.S. by a father who was a colonel in the Air Force (a hump pilot during WWII and later a lawyer in the JAG for the Air Force). She lived in Colorado Springs and Reno until she was 6 years old; her dad then piled her, her 3-month-old sister, and her mother with all their possessions into a 48’ Studebaker and drove up the all-dirt Alcan Highway to Fairbanks, Alaska, where she attended first and second grade in a Quonset hut. Climbing on rocks as a child in the west was a way of life, which undoubtedly stimulated an interest in geology. When she was a child, her uncle would ask her what she wanted to be, and when she would reply “a geologist”, he would say, “You’ll outgrow it”. Tired of being uprooted, she set roots down at Penn State where she received a scholarship, assistantship, and then a fellowship; in 9 years, she left Penn State with a B.S., M.S., and Ph.D. in geology/volcanology to return to Colorado for a job with the USGS. 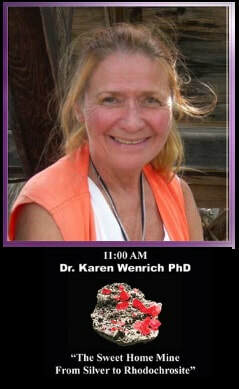 Karen’s Ph.D. was on “Trace and major element chemistry and the petrogenesis of lavas from the upper portion of Humphrey’s Peak, San Francisco Mountain, Flagstaff, Arizona.” Karen was quickly converted to an economic geologist by the USGS, where she worked for 25 years (at least 15 years doing field work in Arizona) until 1997, followed by her present career, consulting for the mining industry. From 2002-2005, Karen worked with diplomatic status for the International Atomic Energy Agency in Vienna, Austria, as their senior uranium geologist in charge of studying worldwide uranium resources. As an IAEA staff member, she was a joint recipient of the 2005 Nobel Peace Prize. She testified in 2008, 2010, and 2011 before the U.S. House Natural Resources Committee. She has published over 175 papers, and received several USGS outstanding performance awards and AAPG best paper presentation awards. In March 2015, Karen married a Penn State geology classmate, Lenny Wildrick (a hydrogeologist), who she has known for 50 years. 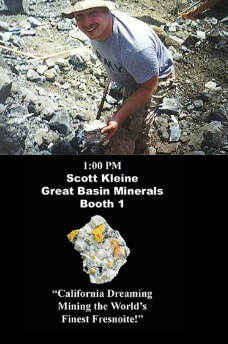 My name is Scott Kleine and I specialize in fine and rare mineral specimens from the great State of Nevada & California. Ammonites within the Family Nostoceratidae Hyatt, 1894 are among the most interesting, unusual and attractive fossils in museum and private collections. They include such unique and bizarre forms as Ainoceras, Anaklinoceras, Bostrychoceras, Didymoceras, Hyphantoceras, Muramotoceras, Nipponites, Nostoceras, Pravitoceras, and Yezoceras to name a few. Their geometric and wildly helical coiling makes these fascinating shells easily recognizable and highly desirable. In most species the body chamber hung below their helical coils most often in a curved U-shape, but in others it may have swung away, around, over, or closely under the initial helical whorls. Nostoceratids are quite important to geologists, biostratigraphers and paleontologists as their distinct forms and wide gamut over ancient seas allows them to often be used as range zone indicators. 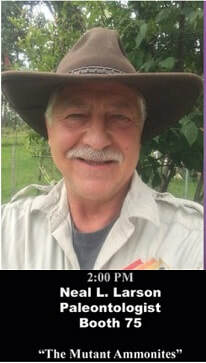 This talk will cover all of the known genera of Nostocerids and many of their species from many world wide localities. In founding Crystal Springs Mining & Jewelry Company, Thomas Nagin created a multifaceted and lifelong career of exploration, mining, buying, preparing, and selling world-class gem and mineral specimens from throughout the world. When he travels for minerals, Thomas also finds and brings home a little bit of art and culture in the form of beautiful one-of-a-kind objects from local artists. What are meteorites? How do meteoriticists — the scientists who study meteorites — classify them? What kinds of evidence exist for impacts on Earth? Join Ron Hranac, a member of the Colorado Meteorite Society, International Meteorite Collectors Association, and Denver Astronomical Society, as he answers these and other questions about rocks from space. Attendees will have a chance to see and handle a variety of meteorites — including some rare lunar and Martian specimens. A collection of meteor-wrongs will challenge you to tell the difference between terrestrial rocks that are commonly mistaken for meteorites, and the real thing. 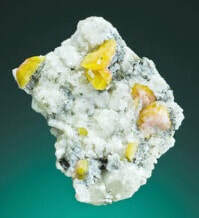 Highlights of the February 2013 Chelyabinsk, Russia event will be discussed, and tips about acquiring and collecting meteorites will be provided. Ron is President of the Denver Astronomical Society (www.denverastro.org), and an avid meteorite collector. He lectures about meteorites at the University of Denver’s historic Chamberlin Observatory as part of Denver Astronomical Society’s Public Night program. He has been a guest lecturer in DU’s astronomy program, at the Denver Museum of Nature and Science, and in area schools and similar venues, sharing his enthusiasm about rocks from space.